I don’t know about you but I despise low flow toilets. They never flush completely. It always takes several flushes when one should do. I understand and honor the need to save water but the damn thing has to work after all. Around here, you can’t buy a regular flow toilet. I threatened to drive to another state to buy one and bring it back, but we decided instead to take a whack at refinishing it. Luckily, my mom had some useful advice. 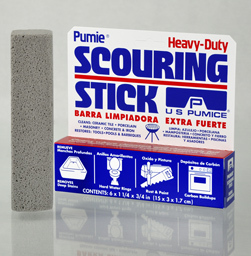 I bought these scouring sticks online. The darned thing worked like a dream! Sometimes, as they say, the old ways are the best ways. Good old-fashioned elbow grease and a pumice stick has this toilet looking brand new again. See? I care about saving water. I saved all the water from the scrubbing and used it on my bushes. This coming weekend is a long holiday weekend so we’ll be putting this back yard to a new messy test as we tile the bathroom.